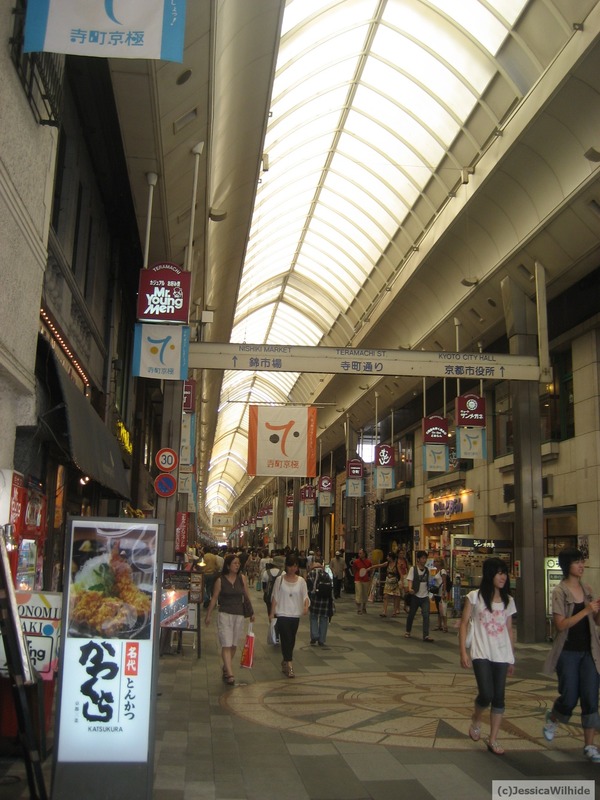 Quand j’habitais Osaka en 2002-03, il m’était plus facile d’aller a Kyoto que dans le sud d’Osaka donc j’y passe pas mal de temps a courir les temples, festivals, parcs et autres magasins. Maintenant a Kobe, il faut faire plus de 8o kilomètres en train pour rejoindre Kawaramachi, le centre de la ville!Et il ma faut maintenant prendre au moins 3 trains!Autant dire que les voyages a Kyoto vont être limites et réservés pour des évènements exceptionnels! When I was living in Osaka in 2002-03, it was easier for me to go to Kyoto rather than in the south of Osaka so I have spent a lot of time there going to the temples and shrines, festivals and parcs. Now in Kobe, I have to go 50 miles by train to the main area of Kawaramachi, and I need to take 3 trains each way!Let’s say that going to Kyoto will be limited to very important events unfortunately. L’occasion cette fois ci était le festival ou matsuri du Daimonji. J’en ai profite auparavant pour faire un petit tour au tour pres de la riviere Kamo et voir si les mêmes magasins étaient toujours la… et bien ils n’ont pas bouge! This time, I went to see the Daimonji matsuri (festivsl). 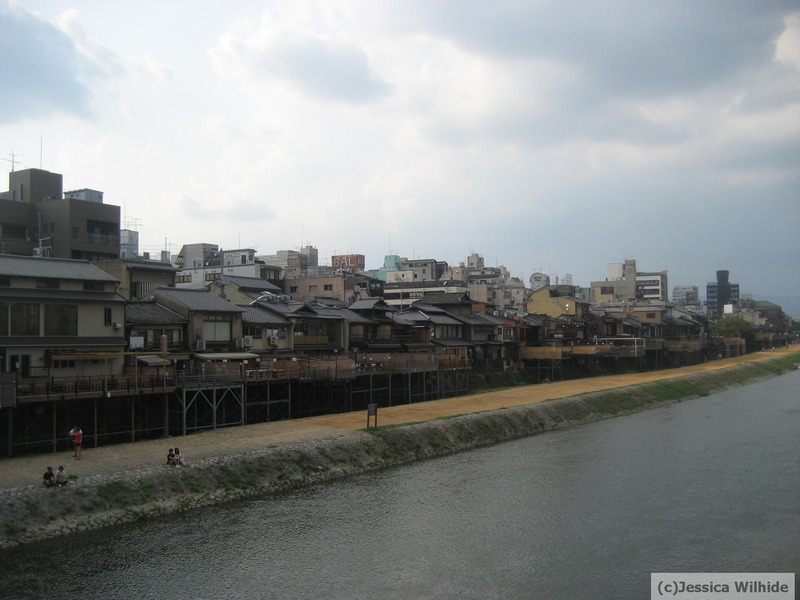 Before, I got lucky to hang out near the Kamo River and see if things had changed …actually not that much as I found out. 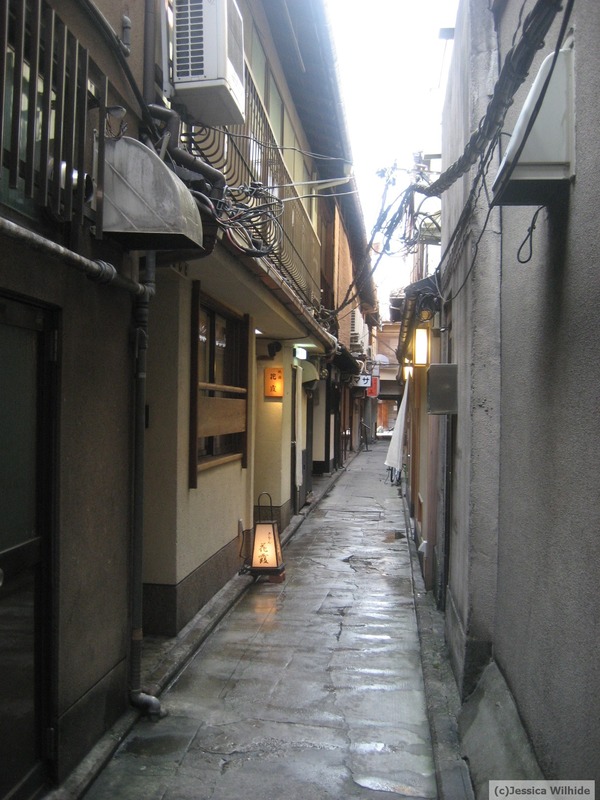 J’en ai aussi profite pour aller dans Gion, le quartier des fameuses geisha et autre maiko (apprenties geisha), le charme des petites rues y est toujours sympas. J’ai meme une la chance de voir une maiko (je pense) sortir d’un taxi et se précipiter dans un restaurant, pas de photo elle etait trop rapide mais son yukata (kimono d’été) était magnifique et son visage très blanc. Les vrais geisha et maiko ne cherchent pas a poser pour les photos et essayent de se faire discrète le plus possible, alors j’ai l’impression d’avoir eu de la chance! I also went to Gion, the famous neigborhood in Kyoto for its geisha and maiko (geisha in training). The charm of the small narrow street is still there. Iwas lucky to catch a glimpse at a maiko running out of a taxi to go into a restaurant. 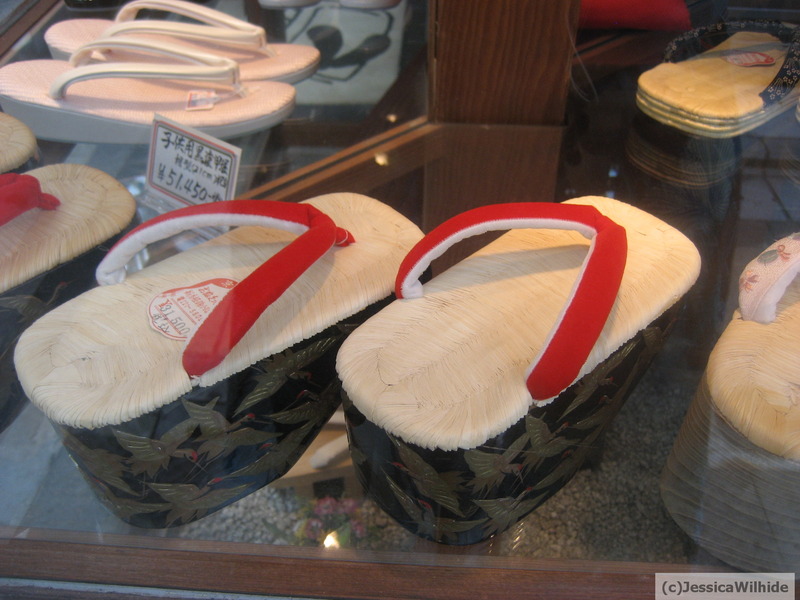 She was too fast for me, but she was wearing a beautiful yukata (summer kimono) and her face was white as snow. The “true” geishas and maikos don’t really stand at the corner of the streets for you to take a picture and try to be really discreet so I feel like I got lucky to spot one!! So Daimonji! This festival is the height of the traditional Obon holiday (festival of the death). 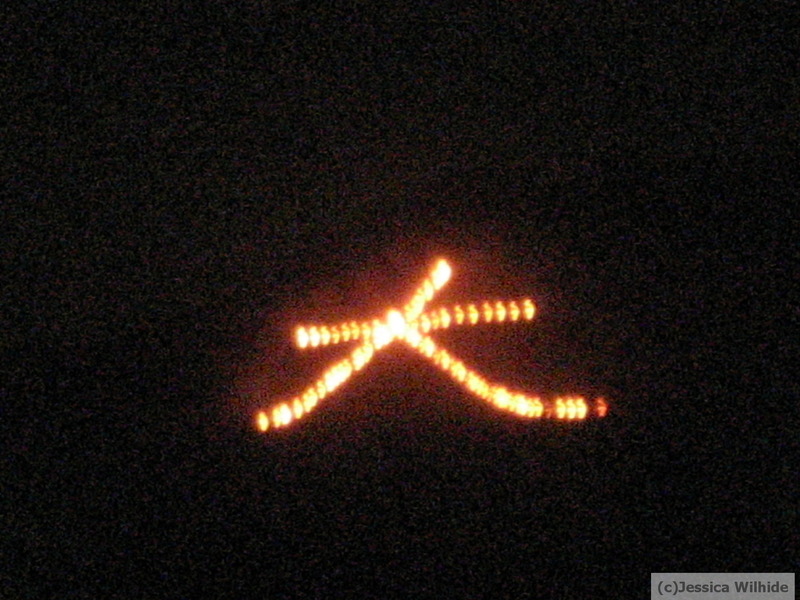 Over 5 hills surrounding Kyoto, 5 Japanese characters or kanjis are burned into the forest. The first one a 8: Daimonji which means big and 4 others are light up one after the others until 8:30. From where we were we could only see Daimonji, it’s too bad because there was a lot of people and we got to see only 1!Next time, we will probably try to go outside the city and maybe we will be more lucky!